I’ve been performing the quarterly update on the portfolios I manage and searching high and low for a bit more yield for the bond and cash portions of the portfolios. I don’t want to mislead in this article because the investments I will be discussing are a bit riskier than FDIC insured certificates of deposit or government bonds. 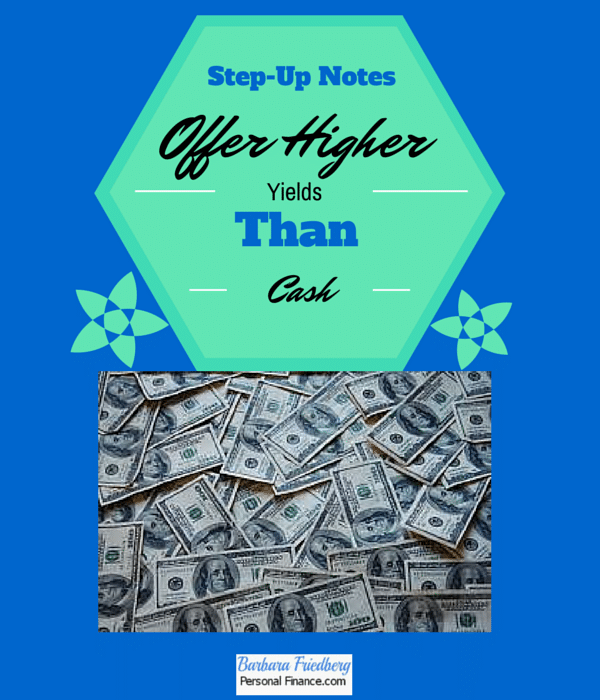 Step up notes are a type of bond with credit ratings from AAA on down to C.
According to Investopedia, “A Step-up Bond pays an initial coupon rate for the first period, and then a higher coupon rate for the following periods. For example a five year bond may pay a 4% coupon for the first two years of its life and a 6% coupon for the next three years” (Of course, not in this interest rate environment) :). This bond can be called quarterly starting in November, 2013. So if interest rates stay substantially low with few prospects for increase it’s likely the issuer will call or buy back the bond before maturity. So, what’s the average annual return if the step-up note is held to maturity? According to my calculations, the bond will yield an annual rate of 4% for 15 years. Obviously, no one knows what the future holds for interest rates. The issuer hopes that the interest rate outlook is low so that they can call the bond and reissue another with lower rates. I hope the rates increase gradually, but less than those being offered on this bond, so that the bond reaps a premium. In this low interest rate environment, getting any kind of return on the fixed portion of a portfolio is quite difficult. Since no one can predict the future, one only knows the realized yield (the actual return on one’s investment, calculated after the fact) later. If I anticipated use for these funds in the near future, I would not choose step up notes. According to the issuer, there is no promise of liquidity. In other words, there’s no guarantee these notes can be sold in the secondary market. That said, for investors looking for a bit more yield, with enough cash to diversify their individual bond portfolios, step up notes might be worth checking out. Another option for higher returns is investing with Peer to Peer (P2P) lending platforms. I’ve lent through both Prosper and Lending Club for a small portion of my portfolio. Recently, my diversified investments in the P2P investments has yielded about 8%. This is a lot higher than the average savings account or riskier corporate bond yields. Where are you investing for yield? Congratulations on getting a successful book launch. Is the book free to download from May 1st through May 5th? HI Shilpan, Book is free May 1 through May 5.Feel free to download and share with your readers! Thanks for the mention. Wishing you success with the book. I’m so jealous! Thanks so much for the mention Barb, I really appreciate it. Congrats on the launch of the book, very exciting! Congrats on the free book – this guy picked up a copy. For yield? I’m investing back into my house. There’s a mighty tail wind in the Bay Area, so once this fixer upper is done (soon) I’ll have to change that answer, haha. Hi PK, Sounds like a wise use of your resources!!! Great way to grow your wealth is to buy undervalued fixer and improve the value. @Dave, John, and PK, thank you all for the well wishes! What are your thoughts on junk bonds in the current environment? Buying them now may not be ideal if you think the stock market is inflated, but if someone bought them in 2011-2012, they may provide excellent returns in the future. They definitely have a higher risk and high correlation to stocks and may not be suitable as a low-risk income holding. @Anton, I have bought junk bonds in the past. Currently, I am not invested in junk bonds. If you are searching for yield, and are aware of the default and interest rate risk, then they can be an option. Personally, for my more risky fixed income investing, I am loaning through P2P via Lending Club and Prosper.